That big red, white and pink holiday is just around the corner and there’s still time to send out a pop-up valentine card to someone you know. 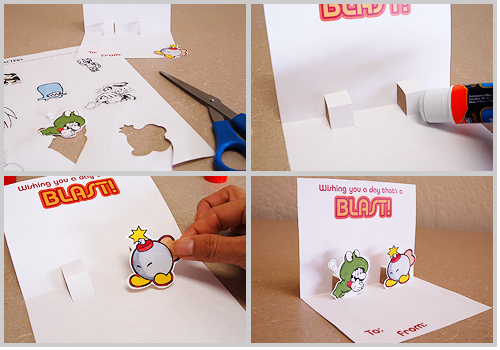 I learned how to make these pop-up cards way back in elementary school and they’re easy and fun to make. 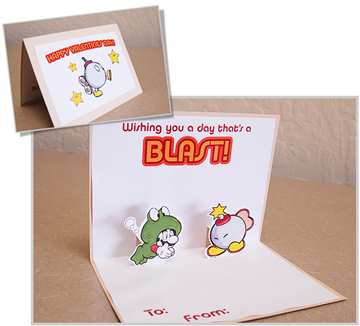 All kids and teens out there, think of how much Mom or Grandma would appreciate it if she received one of these cards? Who knows, she may even sign you up for that iD overnight summer camp right after she opens it. I might give one to my manager at the office and see if it gives me clearance to attend a site visit at one of our Visual Arts Academies so I can brush up on my filmmaking skills. It’s always worth a try. Below are two templates that I’ve created that you can choose from. The first one allows you to have one pop-up image; the second template gives you spots for two pop-up characters. 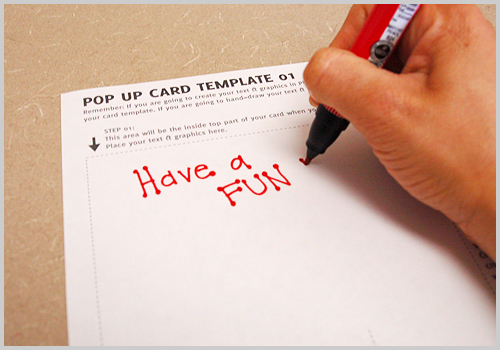 Once you download them, don’t print them out just yet, since you’ll want to first decide what and how you’re going to write a phrase on the inside of the card (the template you just downloaded.) You have two options here. The first is that you can grab art supplies you have at home and hand-write a phrase. If you decide to do this then go ahead and print the template. 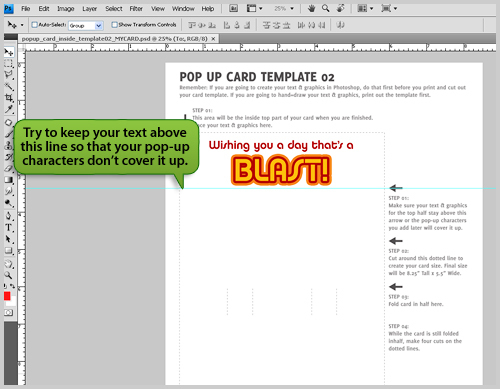 If you have Photoshop at home, you can also open the PDF template into Photoshop and create your text there. After you’ve created your text phrase and any other design elements in Photoshop, then you can print the template on your home computer. Being that I love to use Photoshop, I decided to open my card up in Photoshop and add some of my own flair using the skills I’ve learned as a graphic designer. Download the page of gaming characters to add as the pop-up elements to your card. You’ll be doing the same thing here as before; you can either color them with art supplies or you can color them in Photoshop. If you thought all valentines were adorned with mushy hearts and flowers, think again. 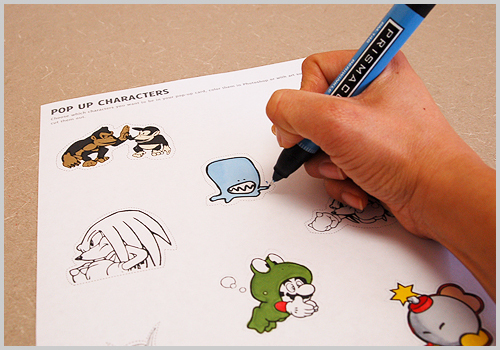 I’ve picked out some cool characters that could be in your projects this summer if you attend one of our game camps. Now that you have all of your artwork prepped, let’s recap what you should have in order to assemble your card. The inside part of your card taken from the downloadable template. An outer part or cover for your card. You can use a nice piece of construction paper or just another piece of printer paper. Your cutout characters, colored and ready to go. Glue or another adhesive like double-sided tape. 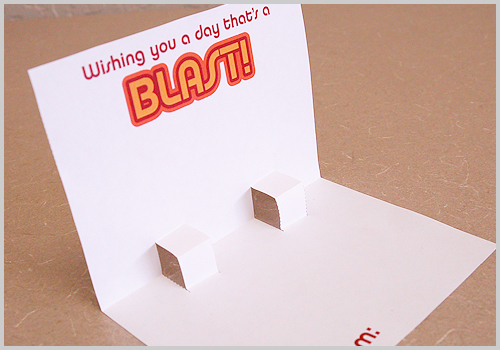 First take your inside template, cut out the card to be 8.25”tall x 5.5” wide. Fold it in half and cut on the dotted lines. Next, open your card up and fold it the opposite way so that your text is on the inside of the fold. Open the card slightly, and use your finger to push forward the flap(s) that you just created by cutting on the dotted lines in Step 2. Slide a pencil into the flaps, so it’s easier to do the next step. 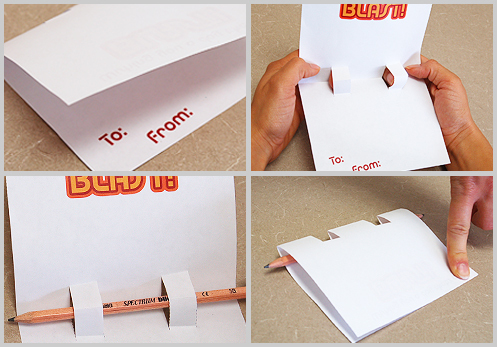 With the pencil still in place, fold your card so that you crease the flap you just pushed in. Your card should now look like this. Cut out the characters you want inside your card. 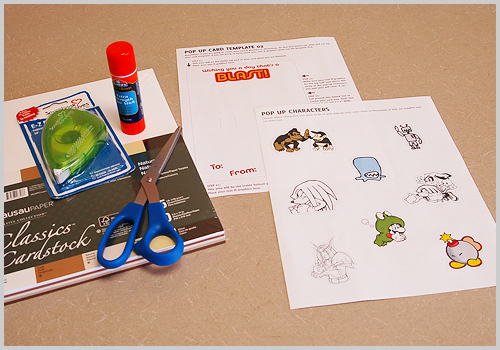 Then on the front area of your pop-up flap, place an adhesive like glue or double sided tape.Take your character and stick him on the front of the pop-up flap. Open and close your card and see how cool it looks! Now we just have to put the last finishing touch on it. We need the cover so that the person who receives the card doesn’t see the big pop-up hole(s). Cut out a piece of construction paper to the dimensions of 8.25” tall x 5.5”wide (if you want your card to have a border on the inside, cut it a bit bigger). If you don’t have construction paper handy, white printer paper will do just fine.Fold your outer cover in half, then using an adhesive, stick the cover to the outside of the card.Once your card is dry, you can decorate the outside. I created my outside design in Photoshop.